Last year on our annual trip to Maine, my friend Jen had brought this simple quilt pattern with her. I had brought a collection of Kaffe Fassett fat quarters that I had gotten from the Fat Quarter Shop. I had no idea what to do with them as some were amazingly beautiful and some struck me as just plain odd. 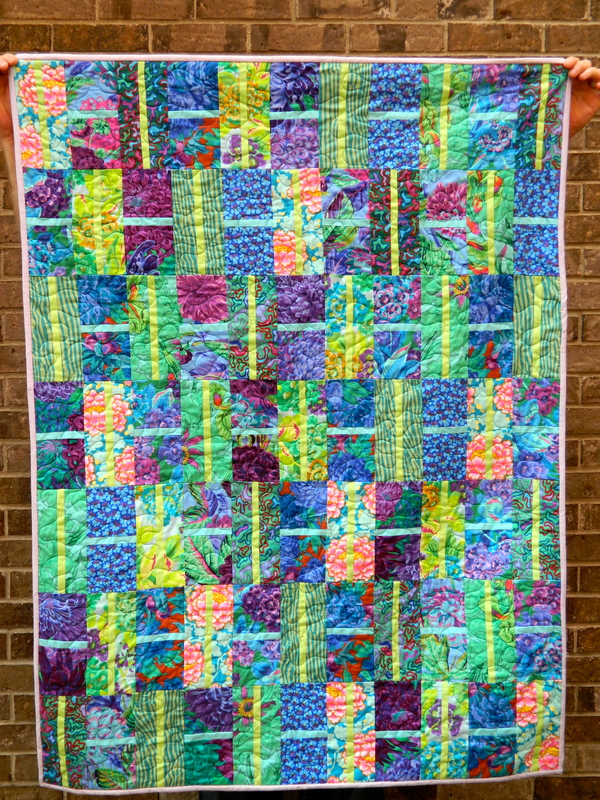 I loved the way Jen’s quilt turned out, so I used the pattern and my fat quarters and made this quilt. It now hangs on my daughter’s bedroom wall and is bright and cheery. I had a lot of fabric left over and finally on this year’s summer trip, I decided to use up the scraps. 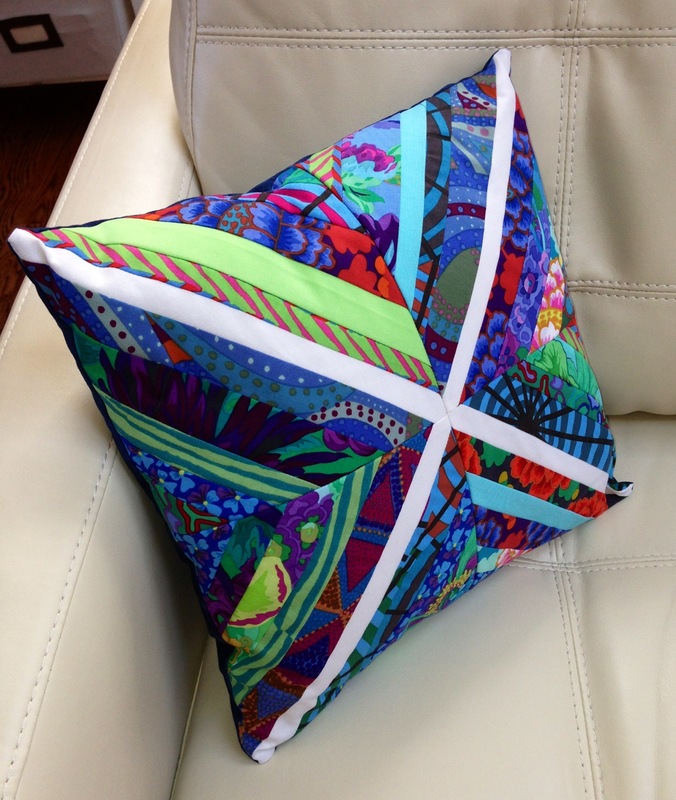 I love making pillows and am a fan of string quilts, so I created this string pillow pattern. I made two and sold them at the first two craft shows I did, so I made two more today. Then, I still had scraps left over so I started two more pillow cases and some matching coasters too. Can you tell I hate to throw out even a single 1″ x 1″ piece of fabric? The construction on this pillow is easy. Take four 7.5″ squares of fabric and mark a half inch to each side of the center diagonally. Cut a bunch of scrappy strips in varying widths from 1″ to 2.5″. You sew your first piece with one raw edge aligned to the line you drew (on either side). Iron it back, and then sew the next strip aligned to the raw edge of the previous piece, and iron that back. When the entire square is covered, iron it well, flip it over and trim it to 7.5″ square. Put four squares together to make a 14.5″ square. I use two 14.5″ x 10″ pieces of fabric for the back, iron and stitch a hem, and then overlap it and sew the two back pieces to the front, right sides together, with the hems overlapping in the center. This makes a 14″ square finished pillow with an easy opening to remove the pillow insert for washing.